We are no strangers to Dosa Express on Green St in Iselin, having visited this South Indian restaurant on multiple occasions. After a gap of a few years, we recently revisited the restaurant. Like a lot of Indian restaurants in Iselin, Dosa Express has no ambiance to speak off except for a few pictures on the wall. 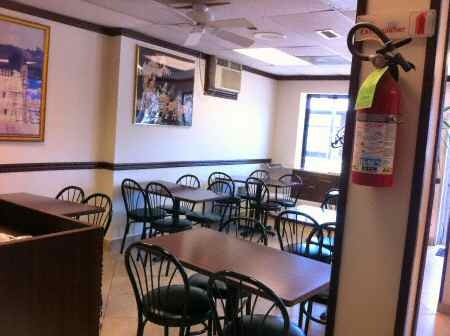 When you enter the restaurant, you have dining tables up front while the cash counter and kitchen are at the rear. 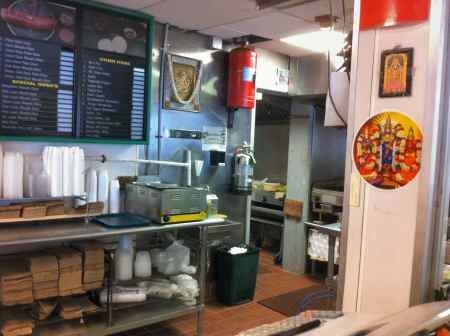 There are a few pictures of Hindu Gods near the cash counter and a menu on the wall behind the counter. You look at the menu on the wall behind the cash counter or pick up a paper menu, place your order, pay the bill and wait at a table to pick up your food. During our recent visit, the old lady at the counter was counting the cash, notes and coins and ignored us until she'd finished. Based on past experience, we steered clear of Dosa and Idli and instead ordered two rice items, Vaangi Bath ($4) and Pongal ($4), for takeout. Our order was ready in about 15 minutes. Here is our take on the two rice items starting with Pongal. 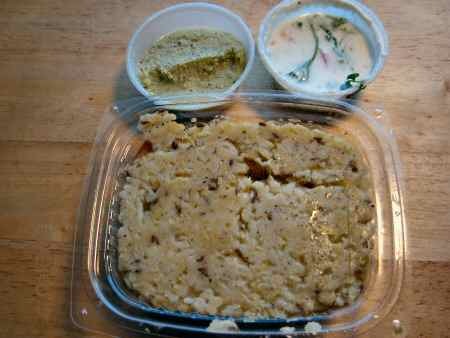 Pongal came packed in a medium-sized plastic box and included Coconut Chutney and Raita on the side. The medium thick Pongal had a strong flavor of moong dal. Alas, it was a bit low on Black Pepper (which renders the magic to a good Pongal). It included a few cashew pieces and jeera seasoning but was missing on green chilli and curry leaves seasoning. Pongal was also low on ghee. But the serving size for the $4 price was decent and filling for a light eater. Coconut Chutney was a little smelly and not as spicy as we'd like it to be. Raita included cut pieces of Tomato, Onion and Cilantro leaves. It was alright. Like Pongal, Vaagi Bath came with Coconut Chutney and Raita sides. It included six medium-sized pieces of cut Brinjal. The Brinjal pieces were tasty with nice flavor of Vangi Bath spice mix. Vangi Bath (a South Indian specialty) was flavorful but could have been a tad spicier. Another thing we liked about the Vaangi Bath was that it was not in the least bit oily. Also, for $4 the serving size was decent. Our take out order was packed neatly in plastic boxes and came in a bag with plastic spoons, forks and napkins. During a previous visit to Dosa Express (a few years back), we had Masala Dosa, Paper Masala Dosa and Medhu Vada. Perhaps the cheap prices explain the crowd at this self-service South Indian restaurant on Green Street in Iselin (New Jersey). When we first visited this dump a couple of years ago on a weekend night, it was crowded. 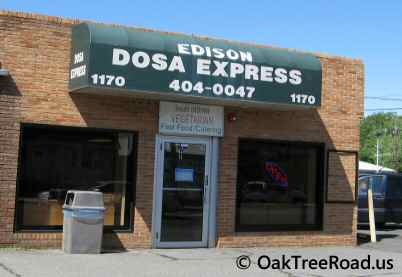 When we recently revisited Dosa Express on a week day evening, the place was still a dump. Yet there were 13 people digging into their Idlis, Medhu Vadas and Dosas. Not bad for a Wednesday evening. As its name suggests, Dosa Express offers a variety of Dosas besides other South Indian favorites such as Idli, Vada, Pongal and Tamarind Rice. In addition to the regular Masala Dosa, the restaurant also serves Butter Masala Dosa, Set Dosa, Paper Masala Dosa, Chili Masala Dosa, Onion Uttapam and more. You pay at the counter, receive a token number and wait for your number to be yelled out. Our Dosas took about 15 minutes but the other dishes arrived earlier. Prices at Dosa Express are cheap. The costliest item on the menu was the Onion, Chili Rava Masala Dosa at $5.75. The Plain Dosa is just $3.00 while a regular Masala Dosa is $4.00. These are hard to beat prices. Idli is $2.25 and Vada $2.75. 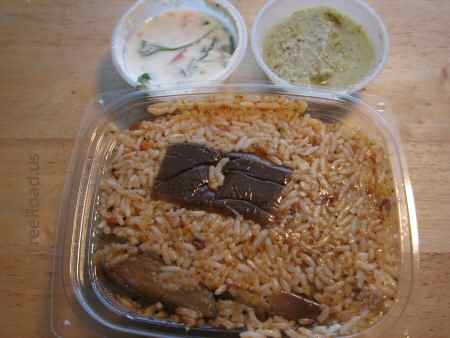 Besi Bele Bath, a specialty from the Southern state of Karnataka, is available on weekends for $4.00. We tried a variety of items including Onion Masala Dosa, Idli, Vada, Paper Masala Dosa and Mango Milk Shake. Except for the Vada, all the other dishes were just plain awful, leaving us baffled as to how this place could possibly stay in business. Both the Masala Dosa and Paper Masala Dosa were almost inedible, let alone palatable. The potato-onion filling in the middle of the Dosas was tasteless. Surely, a Dosa joint that can't make good Dosas belongs in the Ripley's Believe-It-or-Not book. Idli, another South Indian speciality, was only slightly better in taste. The Chutney that came with the Dosas, Idli and Medhu Vada was a disgrace to any Indian restaurant. Hopelessly bland, the Dosa Express Chutney had as much resemblance to the real Chutney as the boxing champion Muhammed Ali has to Julia Roberts. Barely warm, it had no flavor of the rich southern spices that one expects from Sambar. Medhu Vada was the only surprise in an overall bad dining experience at Dosa Express. Although just lukewarm, the Medhu Vada was still crisp and the best item on our plate. We are sure the Vadas at Dosa Express must taste a lot better when they are hot. We dug into the Vada with much gusto and would certainly visit Dosa Express again just for the fine Medhu Vadas they serve. There was no coffee although it was listed on the menu. We met with another shake of the head from the person at the counter when we asked for the Indian soft drink Thums Up, which was also on the menu.